SOUTHSIDE CONDOS IN PRE-CONSTRUCTION BY MALIBU INVESTMENTS INC.
Southside Condos is a new condominium development currently in pre-construction located at 9 Tippett Road in Toronto, Ontario by Malibu Investments Inc. It is part of the Tippett Road Area Regeneration Study which is to "assess the conversion of employment lands through the redesignation of lands to non-employment uses and/or the introduction of residential uses". Southside Condominiums is situated on the east side of Tippett Road and is located south next to 525 Wilson Avenue which is the Gramercy Park Condominiums development that has already been constructed by Malibu Investments Inc. in 2013. There is also another condominium development by another developer that was recently completed located northwest of the Southside Condos on Wilson Avenue. 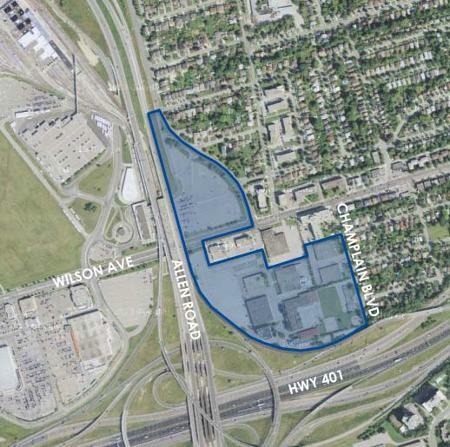 There will be more development phases coming up in the near future located in the vicinity on Tippett Road in Toronto. 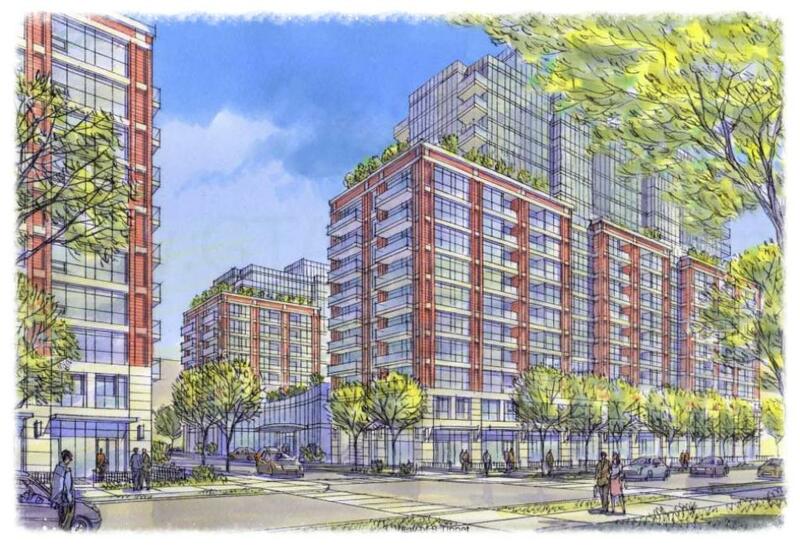 Southside Condos on 9 Tippett Road, Toronto will be a mixed-use development consisting of a 17th and 15th residential tower connected by two 6 storey building base and an 8 storey building base. 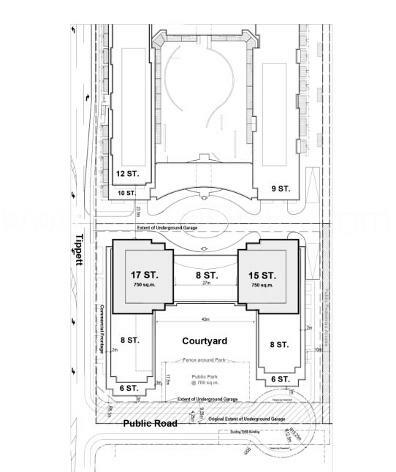 A previous proposal was for an office building on site but it is now instead the Southside Condominiums. Total gross floor area will be 36,232 square metres of which 26,232 square metres is for residential use space and 1,068.38 square metres is for non-residential use space. This non-residential gross floor area on the ground floor is proposed to be used for a seniors drop-in centre. There will be 500 proposed dwelling units consisting of bachelor, one-bedroom and two-bedroom units. Also proposed are 25 affordable ownership units within this residential development. In addition, proposed is a central outdoor courtyard to be located in the middle of these building wings and would include 775 square metres of indoor amenity space and 1,240 square metres of outdoor amenity space. The main entrance into this residential building is proposed to be from Tippett Road. There will be parking proposed for over 400 vehicular spaces located in two levels of underground garage. Southside Condos by Malibu Investments Inc. is located close to the Allen Road, Highway 401 and public accessible transportation with the Wilson TTC Subway Station located nearby. This high-rise tower is also near other new developments that are newly built, under construction and coming soonin the same area. Located in the Wilson Heights neighbourhood in Toronto close to the upscale Yorkdale Shopping Centre and southeast of the Downsview Park and Downsview Airport. 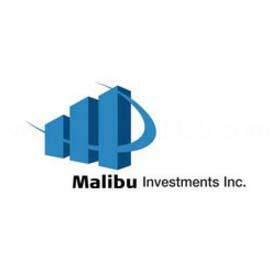 Register with us today for more information on the Southside Condominiums by Malibu Investments Inc.! For more information, please register today for the Southside Condos.